Hello Finatics! Today I write to you about a subject that has had some controversy among many hobbyists and especially those who keep African cichlids. 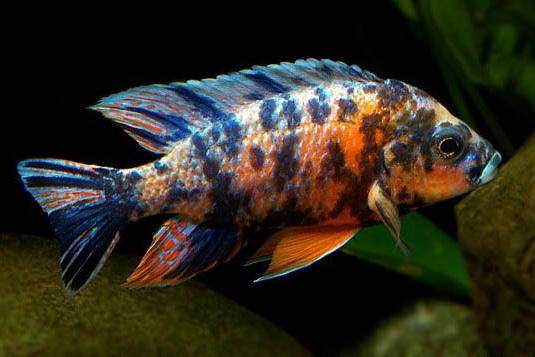 One of the most popular species of African cichlid found throughout the hobby is the OB Peacock. This species can be found in a wide range of colors and patterns, and each looks as amazing as the other. Their color patterns are their trademark that make them so popular in the hobby. I was talking to one of the owners of a local fish store and when I asked them what fish they sold the most, her reply was “OB Peacocks”. She said “they can’t hold on to them whenever they get a new stock of them.” Just as she was telling me that we noticed a customer purchasing some fish and in their bag was an OB Peacock. My reason for making specific reference to OB Peacocks and their popularity is to highlight the fact that these popular fish are actually not found anywhere in the wild. OB Peacocks are hybrids. They we made by a breeder who crossed a male species of Aulonocara with a female OB Mbuna. Now you’re probably wondering why does that matter? Hybrids have been a very controversial topic among those who keep African cichlids (or any other cichlids). Those who have often be referred to as purists believe that hybrids dilute the quality of stock being sold in the hobby. The argument is that people will crossbreed species and create their own hybrid species. Then they take them to their local fish store where they could be sold under a wrong name because they are hybrids and get incorrectly identified in the store. This scenario is definitely a bad one and something I don’t support. The purists in the hobby will suggest that all hybrids are bad, and you will even see suggestions of terminating any hybrid offspring. Such suggestions are something that I do not support. While I do think that hybrid species shouldn’t be taken to local fish stores and made available to others without identifying what they are, terminating the offspring is not a good solution. Like the OB Peacock, every species is beautiful, and terminating a perfectly healthy species of fish should never be considered for any reason, especially because it is a hybrid. There is a speciation mechanism that Darwin studied when he was studying evolution. It is called Adaptive Radiation, and is a type of evolution of species clusters that live in an isolated area where they have overlapping habitats or territories, and compete for food. The finches of the Galapagos are one example and another good example is the cichlids of the African rift lakes. Scientists believe that through adaptive radiation over the span of millions of years, a small group of cichlids originally introduced into Lake Victoria from the Nile River, have evolved into 1,500 or more species that inhabit the lakes today. Even today there are areas of Lake Victoria that have not been explored, so many new species of cichlid could discovered. I mention the concept of adaptive radiation because I want to point out that hybridization is naturally occurring in the lakes where these fish live. African cichlids represent a group of fish that have adapted and evolved over millions of years and will continue to do so because of the geographic characteristics of where they live. Is my hybrid a Tangerine Tiger? It could very well be! Who’s to say that the same thing didn’t happen in the lakes and create the species we hobbyists know as the Tangerine Tiger? Every time I see mine in my aquarium, I think to myself “it’s a Tangerine Tiger”.